Sherpa Blanket: A sherpa blanket isn't just a regular blanket. I'm serious! It's amazing! It's incredibly soft. It definitely keeps you warm while sitting around on your couch all day. My favorite sherpa blanket that I'm covered up in right now has a huge cat covering the entire front. If you know me at all, you know I'm obsessed with cats, so it does make me happy. Netflix: Oh, yes. Netflix is definitely a sick day essential. You can watch tons of movies and t.v. shows right on your phone, computer, or t.v. It's pretty awesome. I've had Netflix for a few years now and it has definitely gotten me through some sick days. My favorite category is probably the Children's/Family section. Disney movies? Yes, please! Fuzzy Socks: I honestly don't know anyone who dislikes fuzzy socks. Seriously. I can't think of one person. They keep your feet so toasty and come in all kinds of different prints and patterns. They make you feel pretty good when you're sick unless your body feels warm. I guess it depends on what kind of sickness you have. Pajamas: It's not crucial to have cute pajamas, but it helps. ;) Matching pajamas are some of the cutest things. It just kind of makes me happy to wear them. They also just make you feel less like a bum while you're sitting around all day. Kleenex: This stuff is a must have! They are so much softer than using toilet paper. Believe me, blowing your nose with Kleenex feels like angel wings caressing your nose compared to using toilet paper that feels like sandpaper cutting you to pieces. Maybe that's a little dramatic...but it's life changing if you're used to only using toilet paper. Coffee & Tea: Ahhhhh, yes. Two of the best beverages on the planet. I'm also a huge fan of Diet Dr. Pepper, but that's besides the point. If your throat is hurting, coffee and tea both help sooth it at least temporarily. Bubble Bath: Taking baths are heaven when you're sick. The hot water just helps open up your lungs and throat. Steaming up and breathing in the hot air really helps you breathe better. Just put on some Pandora and relax. Just concentrate on getting better. Cough Drops: If you get really good flavored cough drops, they are a dream. Not only do they help you stop hacking out in public if you have to be somewhere, but they coat your throat and help medicate it. I really love raspberry flavored cough drops. Honey flavored ones are nice too. 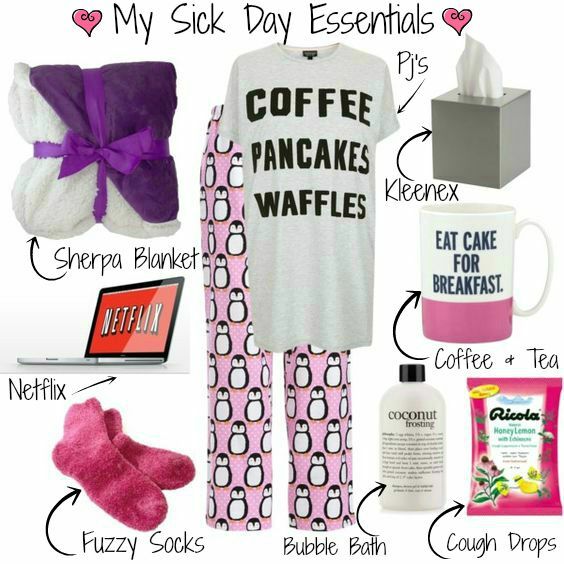 What are your sick day essentials? I'd love to know! I hope you are feeling better by now! I agree with all your must-haves!